Window treatments can really help to set the mood of a room. These days, there are an astonishing number of window treatments available and they all serve different purposes. The option or combination of products you select will be defined by the outcome you’re trying to achieve. If, for example, you want to filter sunlight but retain your view, you might choose voile curtains. However at certain times you may want total privacy so you could add black out linings or fully lined curtains that can create a block when you need it. 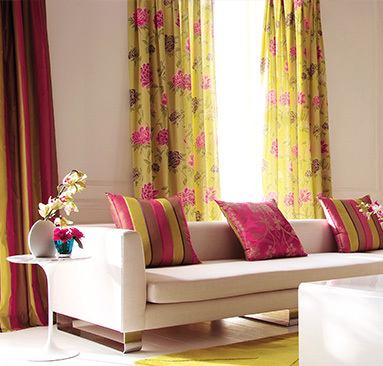 Curtains are always in fashion and we have the largest range of curtain fabrics north of Auckland. They are a very cost-effective way to breathe new life into a room and can really change the way it feels. We are stockists of James Dunlop, Warwick, Designer’s Guild, Textilia, Charles Parsons fabrics and much more. Modern, chic, opulent, cottage style, retro, classic, floral and stripes …we have a fabric to suit every taste and decor. We also have a great range of curtain rods, tie backs and motorised units (these allow you to open your drapes using a remote control).